Hydro-Québec might be opening a dam spillway near Kuujjuaq, Que. in Nunavik and it’s dredging up bad memories. 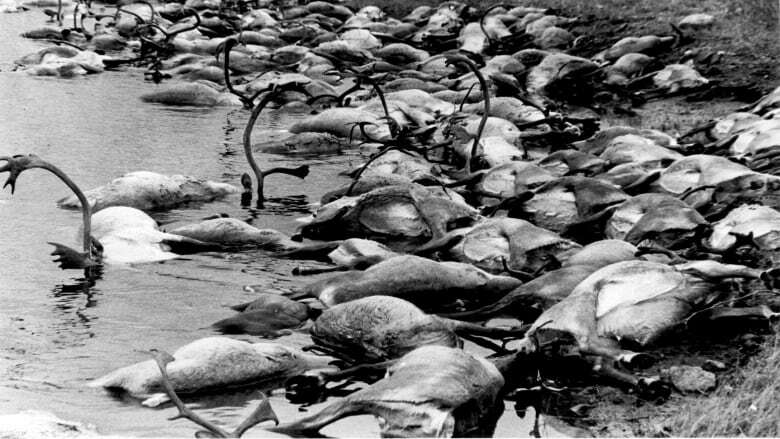 One of the last times the spillway opened in 1984 nearly 10,000 caribou died. Hydro-Québec might be opening a dam spillway near Kuujjuaq, Que. in Nunavik this summer and it's dredging up bad memories. One of the last times the spillway opened — in 1984 — nearly 10,000 caribou died during their annual migration over the Caniapiscau River. 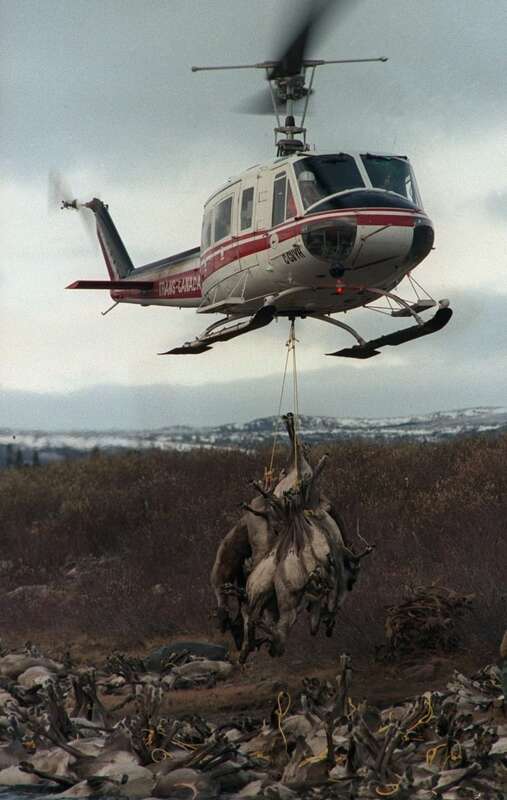 "We don't want any caribou damaged again ever, but currently the migration pattern has shifted to the Hudson [Bay] side, so there's not as much caribou as we used to have within our region," said Kuujjuaq's deputy mayor Sammy Koneak. Hydro-Québec says a few years of high rains in the mid-1980s made flooding inevitable in the area and the controlled water release from the Caniapiscau reservoir actually helped contain the flooding, but residents of Kuujjuaq still have concerns. "When people heard that they were going to do some spilling, it automatically came back that the town was going to be flooded again," said Koneak. The town of Kuujjuaq flooded in 1979 — when there were no water releases — but just being told that water levels would rise with the proposed spill scared residents. "I remember when I was a kid, my dad had a 24-foot freighter canoe... and we were fully loaded driving in the boat on main street going to higher ground. I still remember that quite clearly... It was snowing, it was quite a bad time," Koneak said. Francis Labbé, a communications officer with Hydro-Québec, says the water will rise about 10 centimetres near the town of Kuujjuaq and up to 50 centimetres near Koksoak Island, so there is no risk of the water release causing flooding. The reservoir is currently 88 per cent full and this year the region had a lot of snowfall, so when it melts, if it's coupled with a lot of spring rain, the reservoir will be very nearly 100 per cent full. "That's a point that we don't [want to] reach because at this particular moment you don't control where the water will go out, so we prefer to control all this and let go the smallest amount of water possible through Caniapiscau River so we manage everything," Labbé said. The smallest amount possible is 750 cubic metres per second, which should be about a 15 per cent increase in the volume of water in the river, Labbé said. If the reservoir reaches a point that it needs to be drained, then Hydro-Québec will start the release after June 15 and it will drain at the proposed rate until late August. The electricity company first visited Kuujjuaq in mid-April to consult with residents about the possibility of a water release. "They showed graphs, the terminology that they are used to, we had no clue what they were talking about," Koneak said. A minimum of 30 days advanced consultation is required of Hydro-Québec by the James Bay and Northern Québec Agreement. They came back last Wednesday with a less technical presentation and some answers to residents' questions. Koneak said the May consultation was easier to understand as the staff from Hydro-Québec were more comfortable in English this time and the plans had been simplified, but he says he still wants to see the company's plans for compensation to residents if something goes wrong. "A lot of people are concerned that their cabin is going to be affected and it's going to float away, and how are they going to get it back? Who's going to compensate them?" Labbé says the company has flown over the river and it appears no cabins will be affected. "As local people here in Kuujjuaq we are opposed to this, but we have absolutely no power, we cannot stop them even if we say don't do it," Koneak said. Hydro-Québec says there is no alternative to controlled spilling if the reservoir reaches 100 per cent full, aside from uncontrolled flooding.